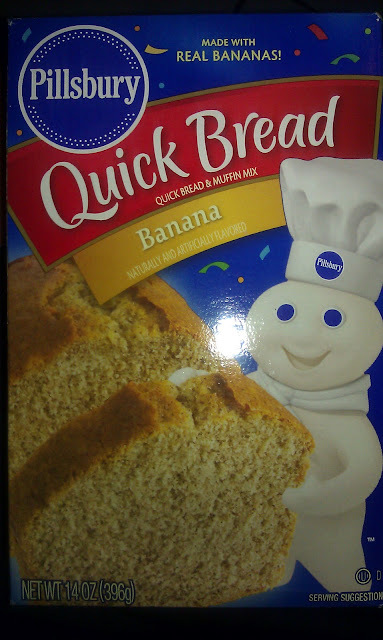 So, while grocery shopping, I saw this banana bread on the shelf, on sale!! !, and decided to try it out. Mike loves banana bread and has asked me to make some before, but I hadn't yet. I thought it would be a nice treat for after dinner. After about 30 minutes, my bread was ready to eat! It was moist and yummy. According to the package, it's made with real bananas. (I always wonder about products that claim to have real something-or-other in it. Is it true? Who knows). I think next time I'll place some chocolate chips in the batter, or maybe some raisins. Or maybe I'll top with some creme and slices of real banana on top. Have any of you made banana bread? Did you add yum-yum ingredients to it? We use this all of the time. We keep the bananas as they start going brown in the freezer and quickly microwave them to add to this mix. We have added choc chips, and we have added flaked almonds. I even throw in a handful of flax seed! and yes, the site does look quite lovely!